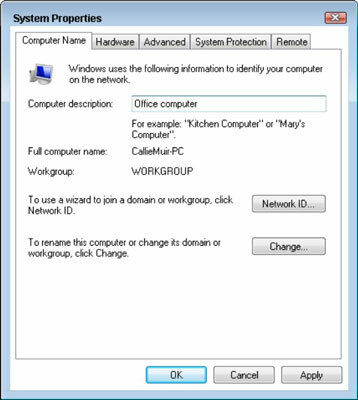 Two computers on the same network cannot have the same name, so it’s important to know how to change a computer’s network name in Windows Vista. 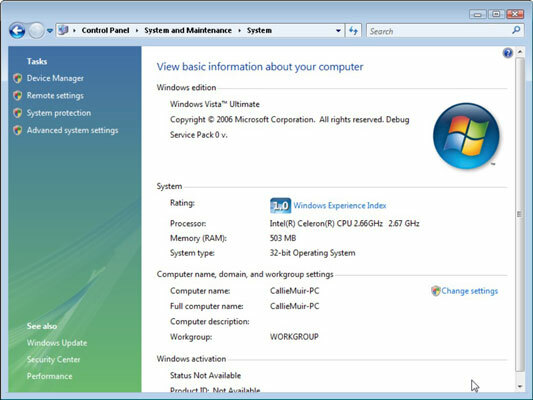 Windows Vista gives each computer the same default name, so you need to modify each computer’s name before you start connecting them to your network. Choose Start→Control Panel→System and Maintenance, click the System link, and then click the Change Settings link. The System window of the Control Panel. This opens the System Properties dialog box. Click the Computer Name tab and then replace the current name with a new name in the Computer Description text box. Click OK to save the new name. Making the computer name descriptive is useful: Simple names such as John’s Computer and Basement PC help everybody on the network know which is which. Click the Close button to close the Control Panel.